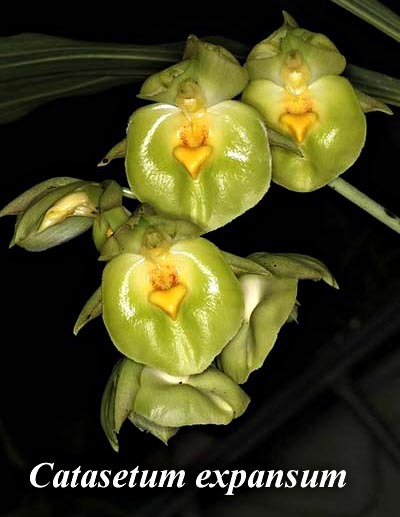 This unusual group of orchids offers fascinating, waxy flowers that often have the peculiar habit of discharging their pollen masses (pollinia) onto pollinators. Almost always deciduous, the pseudobulbous plants have strict growing and resting periods. Most flower before entering a dormant period when they drop their leaves. Light should be strong, especially near the end of the growth period. Early in the annual growth cycle, plants will tolerate less light, from 1,500 to 3,000 foot-candles. Plants grow best with light levels of 3,000 to 6,000 foot-candles, or one-half to three-fourths full sun. As pseudobulbs mature, harden them by giving slightly more light. Temperatures reflect the fact these orchids are native to hot tropical areas and grow during the rainy summer months. During this growing period, day temperatures of 80° to 100° F and night temperatures of 60° to 65° F are beneficial. After growths mature, temperatures can be reduced to 55° F at night, with day temperatures of 70° to 85° F.
Water is a critical factor for the production of large pseudobulbs that result in best flowering. A great quantity of water must be stored by the plant in a relatively short growing season. Water heavily as new leaves are forming. As the pseudobulb matures, gradually reduce watering frequency. Leaves will yellow and drop. At this time, watering should be stopped completely until new growth begins. Water during this dormant period only if the pseudobulbs shrivel severely. Humidity should be 40 to 60 percent. This can be provided in the home by placing the plants on trays of gravel, only partially filled with water so that the plants do not sit in the water. Air should always be moving around the plants to prevent fungal or bacterial disease, especially if high humidity or cool temperatures exist. In the greenhouse, the humidity is best increased by use of a humidifier. Evaporative cooling increases humidity while cooling the air. Fertilize and water regularly to produce strong pseudobulbs. Use a highnitrogen formulation (such as 30-10-10) while plants are in active growth, slowly tapering off as pseudobulbs form. A blossom- booster formulation (such as 10-30- 20) should be used in the autumn, except for plants that normally bloom in the spring. Frequent applications of a dilute concentrations of fertilizer are more effective than occasional applications of strong concentrations. Potting should be timed to coincide with the initiation of new growth, usually in the spring. New roots will be produced quickly at that time, and plants will experience minimal setback. These plants have vigorous root systems and require a rich, moist potting medium during the growing season. Many growers bare-root their plants during the resting period to ensure dryness at that time. Fine-grade media are common for smaller pots; medium-grade media are used only in larger pots. Sphagnum moss is used successfully for plants in many areas, as it provides tremendous water- and fertilizer-holding capacities. Some plants can be grown on slabs of tree fern or other material, which makes it easier to keep them dry during dormancy; however, it is harder to keep them moist while growing. When well grown, these orchids can be divided down to one mature pseudobulb and will then flower on the next mature growth. Spider mites are a common pest of these orchids when in leaf. Control spider mites by keeping humidity high or spraying with recommended miticides.